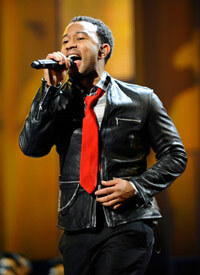 The show was broadcast live on Univision at 8pm ET/PT on November 13th, 2008. Grammy winning singer Alejandra Guzman couldn't resist the temptation of the Xtreme Lashes® area once she saw the excitement from fellow performer Belinda. 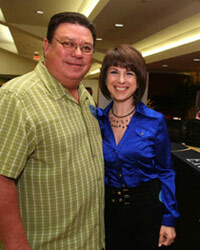 After speaking with Jo Mousselli, Xtreme's President, Alejandra said, "I need these on me now. I have to have them today!" Lash Stylist Maria Herrera was able to squeeze Alejandra in for her "must-have" lash extension application by arranging to meet in her hotel suite, between rehearsals and her onstage performance, with just moments to spare. Singer Belinda (shown left, backstage at the Gift Lounge with Alejandra Guzman and at right, onstage during her Grammy performance) couldn't contain her excitement over Xtreme Lashes® at the Grammy's Gift Lounge. "I want this, I want this," she told Jo. As much as we would have loved to lash Belinda before the show, there simply wasn't enough time to get to everyone on Grammy day. Belinda was thrilled to get a Gift Certificate for a full set of Xtreme Lashes®, though and we promised to get her lashes extended ASAP. Legendary musician Carlos Santana poses with President of Xtreme Lashes®, Jo Mousselli, at the 9th annual Latin Grammy Awards with after checking out our booth at the gift suite. 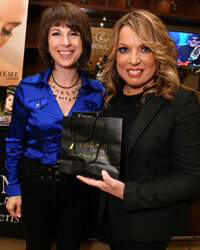 Latin Grammy night performer Jenni Rivera is dying to get her Xtreme Lashes®. She told our event team about seeing them at a salon in California and says she's been in love with the idea ever since. 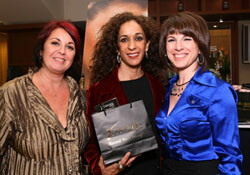 Emily Estefan, who attended the Latin Grammy events with mom Gloria and dad Emilio (pictured on the red carpet at right), was a delight when she stopped by Xtreme Lashes® on Thursday to pick up a gift bag of eye products for herself. Grammy-Award winning Panamanian reggae artist Flex stopped in before rehearsal and talked with Xtreme Lashes® Certified Professional Lash Stylist Maria Herrera. Jackie Guerra, stand-up comic, television and talk-radio host, author and ALMA nominated actress (for her role in 1997's Selena) hammed it up with the Xtreme Team backstage at the 2008 Latin Grammys. Mayrin Villanueva, star of the popular Mexican TV series "Vecinos" and a Latin Grammy Presenter, decided Xtreme Lashes® eyelash extensions were a "must-have" to top off her stunning Grammy attire. She couldn't hide her huge smile after having her lashes styled by Certified Xtreme Lashes® Trainer Alyssa Bruni. "I LOVE THEM," she exclaimed. "They look beautiful... so natural." Univision's fashion experts went on to say Mayrin was "one of the most elegant at the Latin Grammys." 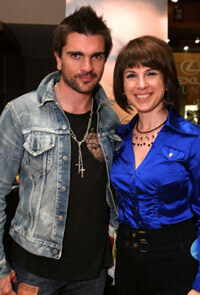 Multi-Grammy winning recording artist Juanes checked out Xtreme Lashes for his wife Karen. He fell in love with the long lashes and asked Xtreme's President Jo Mouselli if he could pick up a gift certificate for Karen. "My wife will love these," he told her and proceeded to ask Xtreme's Stylist at the site, Maria Herrera, is she could call his wife and arrange for the application. 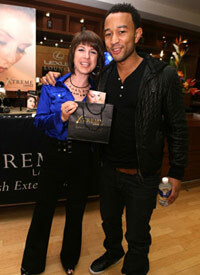 Grammy Award-winning soul singer, songwriter and pianist John Legend, a highlight performer at the 9th Annual Latin Grammy Awards, came by Xtreme Lashes® and talked it up with President Jo Mousselli. John's girlfriend, model Chrissy Teigen, is sure to enjoy the gifts and certificate to have lash extensions applied he left with. "Oh, these look soo natural," Montserrat Oliver said as she got a close up look at the lash extensions on Xtreme Lashes® President Jo Mousselli. The popular actress and model, took time out from her Grammy rehearsals to visit with our team and was impressed to see how beautiful the lashes were in person. The stunning Adriana Fonseca, soap opera actress and model from Mexico, was intrigued with Xtreme Lashes®. 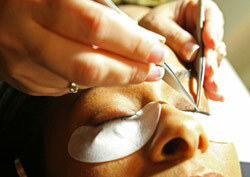 The Latin Grammy presenter was one of a number of stars who made a point of picking themselves up a gift certificate to get their lashes extended by a Certified Xtreme Lashes® Stylist. Latin Grammy-award winning pop band Belanova's lead vocalist Denisse Guerrero and bass player Ricardo "Richie" Arreola dropped in to visit with Xtreme Lashes® and Jo Mousselli in between rehearsals on Wednesday. 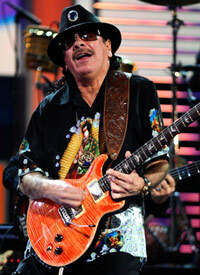 Platinum selling Puerto Rican singer/songwriter Ednita Nazario, pictured at left with Xtreme Lashes® President Jo Mousselli and at right presenting onstage with musician Carlos Santana, was thrilled with the gift of eyecare cosmetics and gift certificate for eyelash extensions she received when she visited with our representatives backstage. 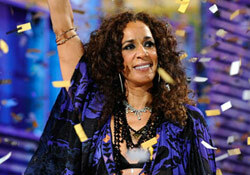 After her spectacular performance onstage at this year's Latin Grammy Awards, Spain's own two-time Grammy winner, pop singer and actress Rosario Flores, will be heading back to Spain with her Xtreme Lashes® gifts and a certificate to get her lashes styled by a top Xtreme Stylist in her home country. Ximena Sariñana, the popular Mexican actress and Grammy nominated singer/songwriter, spent some time with Jo Mousselli, President of Xtreme Lashes®, to learn more about lash extensions and picked herself up a handful of products and a gift certificate to have lashes applied. 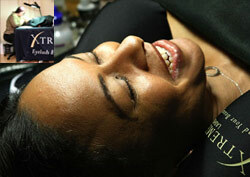 Puerto Rican actress and television host Giselle Blondet was spellbound by the lash extensions on Xtreme's Jo Mousselli. 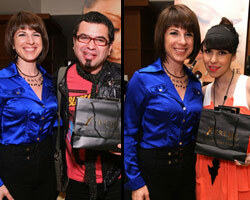 Touted as one of the most promising songwriters of his generation, Venezuelan singer/songwriter Jeremiah, pictured with Jo Mousselli on the left and onstage during his Latin Grammy performance at right, picked up a bevy of goodies to take away from the Xtreme Lashes® area. Tejano musical talent Michael Salgado was all ears while listening to Xtreme Lashes® President Jo Mousselli explain the benefits of lash extensions. 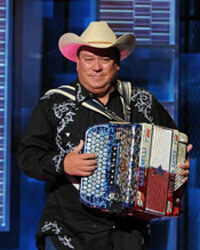 Recognized as one of the top artists in the Tejano industry, David Lee Garza honored Xtreme Lashes® by stopping by to speak with President Jo Mousselli behind the scenes of the 2008 Latin Grammy Awards. 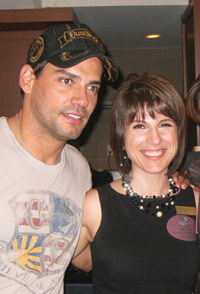 Raul Brindis, singer and star of the renowned nationally syndicated morning show, "El Show de Raul Brindis y Pepito", met up with Certified Xtreme Lashes® Stylist Maria Herrera (left image, left) and Xtreme's President Jo Mousselli (left image, right) backstage at the 2008 Latin Grammy Awards rehearsals. (above, left) Cristián de la Fuente, international film and TV star, co-host of this year’s Latin Grammys and Season 6 "Dancing with the Stars" contestant, stopped by to chat with Xtreme and snag a gift certificate for his wife. 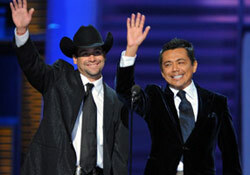 (above, right) Angelica Castro fluttered her Xtreme Lash extensions down the red carpet as she accompanied husband Cristián de la Fuente to the 2008 Latin Grammys. 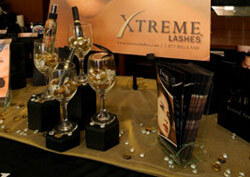 She contacted Xtreme's mobile team and had her lashes styled by Master Stylist Noor Daoudi for the big night. Xtreme Lashes® kicked off the 9th Annual Latin Grammys in style, as one of only a handful of companies selected to participate in the Official Gift Suite, located directly behind the main stage. Acclaimed singer and co-host of the 2008 Latin Grammys, Patricia Manterola picked up a gift certificate, hoping to claim her set of luxury lashes in time to show them off on the Grammys stage. 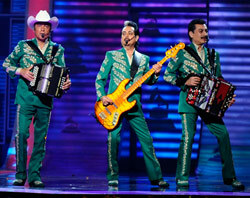 Performers at this year's Latin Grammy Awards, Los Tigres Del Norte stopped by Xtreme Lashes® to pick gift certificates and products up for their special ladies. 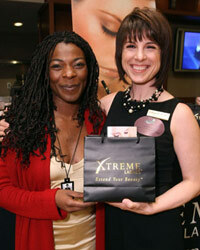 Spanish Singer Buika, pictured at left with Xtreme Lashes® President Jo Mousselli, is one of this year’s Grammy nominees for Album of the Year. Buika was so excited after seeing the lashes first hand; she said she couldn't wait to get back home and have her lashes styled by the experts at the Xtreme Lashes® Spain headquarters. Columbian superstar and Grammy-winning singer Fonseca chatted with Xtreme Lashes® President Jo Mousselli while picking up some gifts in between rehearsals for his onstage performance. Sultry singing siren Olga Tañón, whose career as a top vocalist has earned her 5 Grammy Awards, came by the Xtreme Lashes® booth to have her questions about eyelash extensions answered by Xtreme's resident expert, President Jo Mousselli. She left with a selection of beauty products and a gift certificate to extend her own lovely lashes. Xtreme Lashes® President Jo Mousselli met up with members of Bando El Recodo before their Grammy night performance. The gentlemen stopped in to pick up some Xtreme products and gift certificates to have extensions applied for their moms and special someones. Puerto Rican American singer and songwriter Victor Manuelle, pictured on the left with Xtreme Lashes® President Jo Mousselli, made it a point to head over to the Xtreme Lashes® reps and pick up some goodies for the lucky lady in his life. 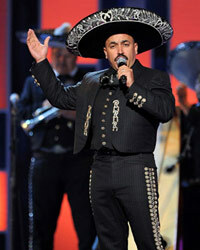 The salsa phenom was onsite rehearsing for his Grammy night performance. Lupillo Rivera, the talented recording artist carrying on the Rivera singing legacy, which includes sister Jenni Rivera and father Pedro Rivera, checked out the ins and outs of eyelash extensions with Xtreme Lashes® President Jo Mousselli before heading to rehearsals at the Latin Grammys. Behind the scenes at the 2008 Latin Grammy rehearsals, Xtreme Lashes® Stylist Maria Herrera is getting our fans ready for their evening of glamour. Rehearsals begin this week for the much anticipated Latin Grammy Awards and Xtreme Lashes® is looking forward to joining in on the festivities. Our team will be backstage during the three day event to help the presenters and nominees extend their beauty® before the big show. To ensure we can accommodate all the stars with their lash needs, we will have three lash stations set up: one backstage at the site, one off site and one mobile for on location applications. 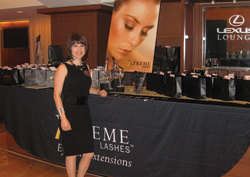 Xtreme Lashes President Jo Mousselli will also be at the event to personally greet the attendees and answer any questions about our company and products. 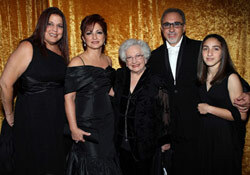 Performers Belinda, Vikki Carr and Jenni Rivera. 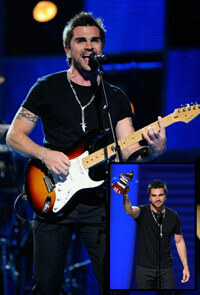 Select images on this page are courtesy of WireImage.